Nothing is worse than moving into a new home in Arizona and finding that it is rampant with pests. There are many pests that can be quite a pain to deal with, and others that are just a mild annoyance in your new home. How do you know what they are and which ones should be taken care of first? Are these pests harmful? Luckily, there are plenty of ways to vet the system and see which pests should have priority over the others when consulting a pest control exterminator in Chandler, and which ones can wait idly by for the can of bug spray to take them out. Here are five pests that can show up when you’re looking to buy a new house. The least dangerous of the pests that you can prepare for are ants. Although they can be annoying, they generally will cause no harm to you. Ants can travel in through tiny cracks near doors and windows, and they tend to contaminate food and invade bathrooms. They can be difficult to get rid of. So when you’re looking for a new home, make sure you look for small cracks that could be potential entrances for these insects. You can fill the small holes with caulking to make sure that they have no way to come into your home. You can also look for dirt piles and leaf litter around your home to make sure there is not a bigger infestation on your property. Next on your list of things to look for when purchasing a new home are signs of mice and rats. A good way to detect the presence of rodents are chewed wires, boxes, and other materials located around your home. Droppings are also a good indication of mice and rats, and they can be found under stoves and in the utility room. These rodents can enter through gaps caused by wiring running into the home, gaps in the garage seals, and other areas that are large enough for them to slip through. Having these crevices sealed is important to keep these vile creatures from entering your home. Probably the worst and most disgusting of the pests that you could encounter is the ever horrible cockroach. These vile things like the comfort of moisture and heat. These little devils like to hang around near drainage, in basements, vents, pantries, cabinets. Nowhere in your home is safe from these disgusting things. Cockroaches like to come out a night, so if you see a lot of them during the day, an infestation might be present, so make sure you get an army of exterminators to kill the abominable things. Cockroaches are truly the worst, and they should all perish. Although cockroaches are horrible and awful, nothing is more costly and annoying to take care of than termites. Termites travel through mud tubes to keep them protected from outside factors. Look for these mud tubes around baseboards as well as windows and anywhere you think that their might be a termite infestation in Chandler. Sometimes the mud tubes can also be found between wooden beams located in basements. In addition to mud tubes, if you see a lot of wings lying around, this is another sign of an infestation. Finding these infestations early can help you fight off the problem before it becomes a big issue. Another extremely annoying pest to get rid of is the bed bugs. Although they aren’t particularly dangerous, they have been known to bite people and they can spread like wildfire. Mattress crevices and floor boards are the prime spot for these horrible things, so make sure you check for them thoroughly when buying a new home. You can also find them in curtains, seams of chairs and couches, and even in between cushions. They can be crafty little buggers and are good at finding multiple hiding places in your home. 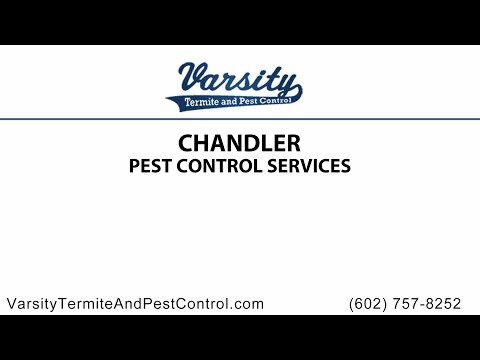 For the best Arizona Pest Control service, come to Varsity Termite and Pest Control, where we can take care of any pest problem that you may encounter. Moving into a new house can be difficult when trying to cover all your bases. With Varsity Termite and Pest Control, you can check one more thing off your to-do list. Take care of those disgusting pests with Varsity Termite and Pest Control. Contact us for more information.